This is the first of three posts that will translate the three interviews with the big staff members for Free! Eternal Summer. – The tagline for Free! was “Swimming x Friendship x Bonds x Upper Bodies.” What would this season’s tagline be? In the second season, Nagisa and Rei are second years while Haruka, Makoto, and Rin become third years. This third year is where you determine your career path. Retirement. Graduation. Moving on. Those are things you wanted to avoid in high school, so I personally wanted to depict those themes upon doing a second season. We could go with the boys together towards the future. – New characters appear in the second season. 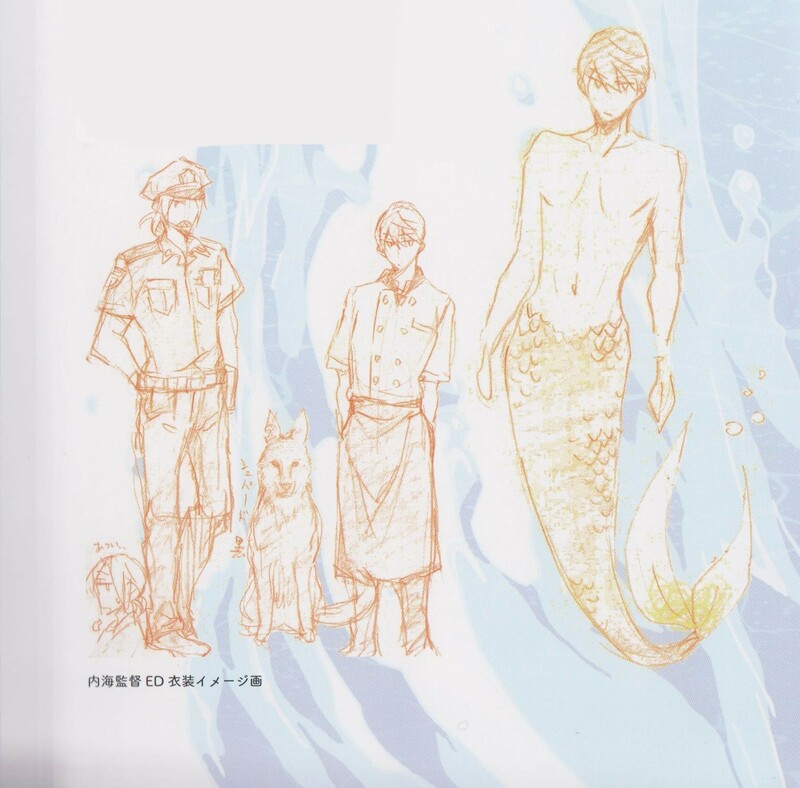 To start, what gave you the impetus to feature Sousuke? 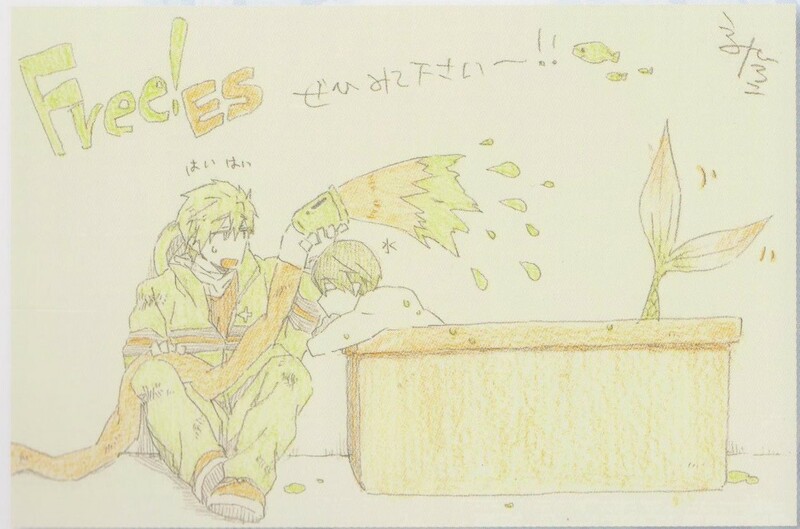 While working on the second season, Sousuke started appearing from the early drafts of the series. 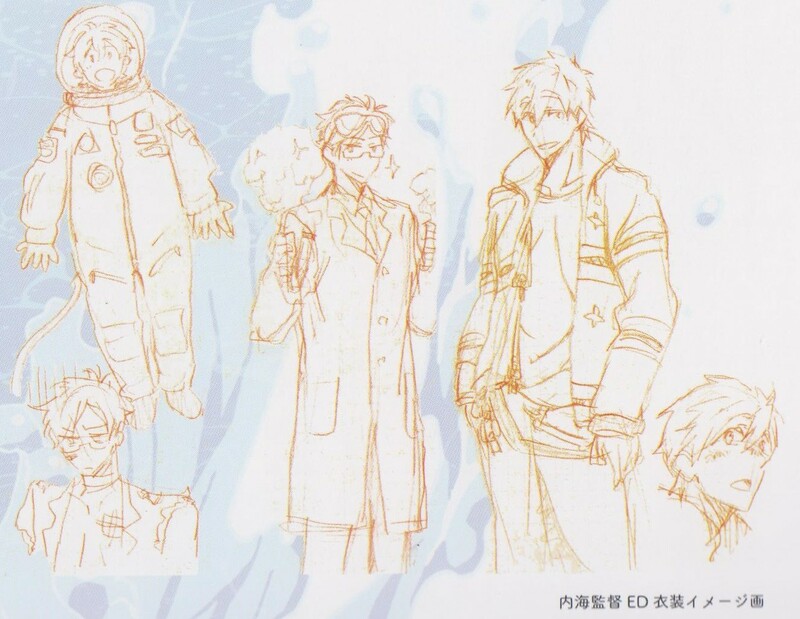 Sousuke’s position in the original High Speed! novel was very interesting to me; his relationship with Rin charmed me. I absolutely didn’t want to let him slip away. As I was discussing the series with the composer Yokotani-san, I mentioned that it’d be entertaining if he showed up since Rin would also need partners. So we told his story. – Please tell us about the secret story of how Momotarou was created. His older brother, Seijyuurou Mikoshiba, was incredibly impactful, so we created a story where his brother would come as his successor. However, if he had the same personality and high spirited nature as his brother, he’d just become a gag, so we thought about how to separate Momotarou. He’s similar to his brother in his cheerfulness and his love of girls. He’s the character that Yokotani-san had in mind from the very start. Since he’s hasn’t grown up to be the high school boy we’re used to, he has that certain fresh feeling to him, doesn’t he….. While his brother’s physique is quite nice, Momotarou has that slender, childish feeling, so character designer Nishiya-san brought it out and touched it up a little. – With Samezuka gaining 2 new members, naturally everyone thinks they’ll go into a relay. What can you tell us about the events to come? It’s just as everyone thinks! There are relays! The Iwatobi side already has 4 members, so since Samezuka is has a history of swimmers, their ratio of successful applicants is high. Perhaps an impertinent rookie may appear! I think you’ll enjoy seeing who the medley members would be! – Let’s talk about each character’s high points in Free! ES. Tell us about Haruka. Haruka’s the same! (laughs) He’s the same cool, nonchalant boy; I think everyone would enjoy seeing his unchanged points. …….but Haruka’s awoken to the presence of “partners” through the events in the first season. He’s even saying he wants to swim the relay with others. From that point, he’s slowly changing through his own pace. It’d make me happy if you watch over him while he changes at Haruka speed. Makoto is seen as the same sweet, caring, club president who has also grown up. However, he and Haruka are changing similarly. I can’t say how he’s changing, but it’s how you would imagine Makoto to think. The strong relationship between the two may also change too……..perhaps? Nagisa wasn’t seen without his cheerful naivety in the first season, but there’s a different side featured in the second. There’s a moment where the always smiling Nagisa suddenly changes. When will that come? How would he appear? Please enjoying imagining how that looks! Personally, it makes me happy to depict Nagisa’s story which we weren’t able to show in the first season. I enjoyed it. How could Rei, the ascetic beauty lover who showed various expressions in the first season, change in the second? Would he learn to swim other strokes…..or would he end up only swimming butterfly like Haruka only swims free? How would Rin grow from the first season? Make sure you see with your own eyes! The Rin who hit his own wall and overcame that wall with the help of his partners in the first season has only gone swimmingly since. I don’t think anyone would stop after that. In the first season, Rin had many dark and spicy expressions, but now we see many different expressions now. That doesn’t mean he’s gone back to the way he used to be, but rather we may be seeing the original Rin. Nitori, who showed up sparingly in the first season, appears again in season 2! And he swims!! Nitori also goes through some changes in season 2, so look forward to seeing how he grows at Samezuka. – Some words for Sousuke? Also, I want to highlight the relationship he has with Rin. Their past also shows up. Pieces will gradually be revealed, so don’t miss them! – Finally, what about Momotarou? “Physical beauty” is still strong! – What did you focus on when making the visuals? For drawings, I wanted to continue to display and convey “water’s charm” and “beautiful muscles”. Emotions were the important point in regards for the story. As I began thinking about how the boys would feel, I soon saw their natural expressions and movements. But this time I had to think about 8 people! That’s obviously a pain! But, by thinking about how everyone would act and the reasons behind their lines, it was really easy to create how the scenes would look and sound since I understood everything. If I hadn’t done that, I would still be thinking how things should go and nothing would happen. It’s really necessary for me to think about that. – Were there any impressive episodes during your discussion of the scenario with Yokotani-san? Also, he and I have different opinions on how a character should look, so we take our time bouncing ideas on each other. – I’m very curious about the conversations between Rin and Sousuke. Could you compare them to the childhood friends Haruka and Makoto? Both relationships are in the same position of “close friend,” but you’ll see that the relationship between Rin and Sousuke is different than Haruka and Makoto. Those differences were one point that I wanted to depict. I feel they became a highlight of this season! That made me start to constantly think about how best to convey the actions to the staff so that they don’t get discouraged when drawing. – Do you have any stories about how you directed emotional moments? There’s a lot of emotional moments where works can’t fully explain the feeling, so I would try and convey nuisances about their expressions in the storyboards. Nishiya-san is amazing at uncovering the meaning and being able to put it in drawing. He’s always saving me. – In Free!, you were the one who conceptualized the themes of the opening and endings. What can you tell us about those in Free! ES? I was anxious over whether or not I could create visuals to match the music…. Could I create something that’s cool, yet heartrendering at the same time……. This one didn’t just focus on Iwatoi; Samezuka was also included. The many swimming scenes also helped strengthen the feeling that it’s a sports show. Also, the visual of the bird helped tie everything together visually. – Please tell us a little about the ending. I first started with fleshing out the images in my head of everyone and requesting similar music. Like the first season, I wanted to show the boys in ways they won’t appear in the main story. Though this isn’t necessarily unrelated; it connects to the theme of “future” shown in season 2. There’s a time in everyone’s life where they think about what they want to be when they grow up. That unknown future became the theme for that reason. – Director Utsumi, what for you has changed from the first season into the second? – You’re nervous about that?! I’m very nervous!! Of course, if I don’t have confidence in the charm of muscles in a scene and it wouldn’t be good to show them, then we won’t show them. It definitely makes you nervous though. But since we started airing, I’ve received some responses saying “though I have no interest in them, I can see why someone would.” Muscley pose struck. Even on the staff side, we’ve had some people wake up to the charm of muscles. (laughs) I want to gradually spread the knowledge of their charm from here on. – Please tell us some funny secret tales or hidden production stories. This is a story about how Nishiya-san, color design Yoneda-san, and I chose the color of Sousuke’s hair. Both of them mentioned that Sousuke should have a dark hair color, while I said “White would be nice!” We tried it out and he looked like someone who had gone through hell. From then we went on. “It’s gotta be silver!” “That won’t match his white skin!” “Then let’s make his skin browner!” He then became a foreigner. After trying this and that, this and that, we eventually came back to where we started. – What motifs did you have in mind for the new characters? This time we had to decide what the Samezuka characters’ motifs would be. Sousuke is a whale shark. Something like a Rhincodon typus in my mind. For some reason I think of the English phrasing for it; likely from Rin’s “shark” motif. Since he and Rin act similarly at times and he’s someone who understands Rin, picking a friend shark was definitely a good decision. With his tall height and big sturdy body, that matches him pretty well, don’t you think? Since Momotarou swims the backstroke, he’s a sea otter. The general image of otters is a very cute animal, but when you see them innocently breaking open the shells of shellfish, that image gets betrayed quickly. Momotarou also is like that. Nitori was also assigned to be a “duck.” Just like in the tale of the “ugly duckling,” will Nitori become a beautiful swan, or will a duck be a duck after all……. I felt that enjoyment would suit him nicely. – Please give a message to all the fans waiting for the second season. Thanks for waiting! Truly thank you all for waiting for us…..
Because of your loud support, we were able to make this second season. I’m filled with gratitude. In return, I offer this second season to you all. Please accept it with thanks. For those who didn’t see the first season, and those who saw a “sight they’ve never seen before,” let’s all go through this summer with the boys! This entry was posted in FREE!, Kyoto Animation, Translations and tagged director, free, hiroko utsumi, interview. Bookmark the permalink.